I hail from a small town called Oddanchatram in central Tamil Nadu. But, I managed to get good quality education, thanks to my parents and my school(Christian Matriculation school, Oddanchatram). I studied in the same school till my 12th standard. My father V.Palanichamy is an advocate(a former government pleader and a public prosecutor) and my mother R.Kasthuri is a teacher in a government school. My little brother V.P.Cibi is doing his tenth standard. He is one awesome loving fellow, who cherishes my achievements. My father was the one who inspired me to take up the civil services. He gave me immense liberty, which allowed me to develop as a free thinking and an independent individual. My mother was the one who backed me during setbacks. I am one person who always love to come forward and do things. I loved assuming leadership roles in all aspects of life. I was the President of the student union of my college(College of Engineering Guindy). I learnt a lot in this position and I feel that these lessons would help me in my future roles. So, it was not one event which made me enter this career. I think the various events in my life, my father’s inspiration and my innate desire to be a leader made me enter the field. I started full fledged preparations after finishing my U.G. in 2012. Q. In recent times, there is spur in electronic material- blogs, sites, pdfs, rss-feeds. Many aspirants feel bogged down by this information overload. So, how much do you rely on the electronic material vs paper material? I prefer conventional books, not the market materials or e-materials. Original conventional books are more readable and they help you in shaping opinions on your own. If you start searching for market material(both paper and electronic), it becomes very complex. In this information era, the most difficult thing is to pick out the necessary information from the huge chunk of data available. It is better to restrict your time on internet. Stick to a few sites like mrunal.org, prs(for overview on legislations), idsa(for selected foreign policy and strategic policy articles). I would suggest not to spend more than 1-2 hours on internet, on a daily basis. Internet is an ocean where you can get lost. One kind advice. Never depend on market materials, especially for current affairs. Read ‘The Hindu’ daily. I would suggest preparing your own notes from the Hindu. Surf the net only for those areas where you need more background information about a news item. You can spend at least 3-4 hours for newspaper. Link the news items with all the core subjects(eg; link the news items on Supreme Court judgements with the polity topics that you have studied) that are a part of our syllabus. This would help in remembering the subjects and also in making the news more relevant to you. Q. On an average, how many hours do you study? How do you keep study momentum going on? 8-10 hours. I go from one subject to another, when I feel monotonous. I read the class topics daily. So, it makes things much easier. Reading newspaper is always very interesting, but once you give a pause to this habit, it becomes very very difficult. I try to maintain habits, stick to my target of studying hours and I try to stay away from distractions as far as possible. I almost never took a break from studying for more than a day(except for one deepavali and one pongal) in these two years. Once you take a long break(say, 4 or 5 days), it becomes very difficult to get back into the routine. Q. Your booklist strategy for Paper I and paper II. Environment: The Book on ‘environment’ by Shankar IAS academy, written by my forestry mentor Karthikeyan sir. No book; Just Practice; Mock tests; I would have written at least 50 full length tests. Q. Approximate no. of attempted / correct answers in your CSAT? I think I would have got around 120 marks in Paper I and 190 marks in Paper II. No preparation for English. Just tried to solve two or three previous year question papers. Q. In General English paper, four essays were asked: Value based education, PPP in disaster Management, Violence against women, Ecotourism. So, which essay did you write and what keypoints did you include in it? Q. Your booklist strategy for General Knowledge paper. What is your ‘analysis’ of the difficultly of this paper compared to previous years? Nothing specific. The books mentioned for Prelims will do. Newspaper reading is necessary. The question was more like a civil service paper this year, but with comparatively less difficulty. Almost all hot current events were asked (eg: spot fixing, FDI, etc.). If we are aware with the current affairs and have some analysis about these events, then this paper could be managed pretty well. Time was a constraining factor. The fixed space answer sheet was actually helpful. You need not wait to get additional sheets. You will restrict yourself within the given space and hence will not waste a lot of time on familiar questions. In the GK paper, one page was given for each 8 marker. But, in optional paper, the spaces varied for different questions. Sometimes, for a 8 mark question, 2 and a half pages was given while for some 8 markers, only 1 and a half pages was given. Moreover, since no word limit was given, we tried to fill the entire space given. Q. Did you attempt all the questions or did you skip a few? I skipped a few. In GK, I did know three or four 6 mark questions. I skipped these. Moreover, I also missed 2 questions which I knew somewhat, because of lack of time. I think I totally left around 40 marks in GK. I feel that you can write a page or two, in case you at least know something about the question. In GS, it’s almost impossible to know all answers perfectly. But, in case you don’t know anything about a question, then it is better to leave it. This will also save you time, which will surely be insufficient. Q. Your booklist strategy and analysis for the optional subjects. Geology-Principles of Engineering geology-KM Bangar+ My geography (my mains optional) preparations helped me in Geology paper I.. For this, I referred Physical geography-> Savindra Singh and NCERT ‘Fundamentals of Physical geography’. Q. Physical test involves walking 25 kilometers in 4 hours in the case of male candidates and 14 kilometers in 4 hours for female candidates. So how did you prepare for it? Please narrate your experience of that day. I had the habit of jogging(for some 1 or 2 kilometres) daily in the morning or going for a walk whenever I was free. This helped me get through this test. The physical test experience was one of the most unforgettable experiences in the IfoS process. It was a cold day in Delhi. Since I was from the tropical Tamil Nadu, I equipped myself with sweatshirts and gloves, especially since we were asked to report at 6.30 in the morning. It was very foggy and cold. But, once I completed one lap(2.5 kilometres), the body got heated up and hence there was no more the need for sweatshirts or gloves. My plan was to run for as much distance as possible and then complete the rest of the distance by walking. I ran for 3 laps continuously(7.5 km), then started walking. Then, with some intermittent running, I was able to complete the distance with 15 minutes to go. Walking test, I think, cannot be completed purely by walking, especially for male candidates. You need to at least occasionally run in order to save time. Though we have another chance in case we fail in this walking test, it is advisable if we try to finish this test in the first go, when you have 47 other guys running with you. To undergo this test alone will be very difficult, psychologically. Q. Not much is known about medical standards for IFoS- so please narrate you medical checkup. What tests did they conduct? Person with glasses- eligible or not? Height(163 cm for boys.) by the way, for IPS it is 165cm. Spectacled persons are definitely allowed(I myself is an example). But, you have to take your lens’ prescription with you. I think(not sure) persons who have performed corrective surgery(LASEX) to the eye are not allowed in IFoS. Q. Who was the chairman of you interview board? Ms.P.Kilemsungla was the chairperson of my board. She is an educationist and the first woman from Nagaland to be appointed as a member of UPSC. She even got the Padma Shri award this year. The chairperson and the entire board was very cordial. They made me feel very comfortable and this made me give my best in the interview. Q. How long was the interview? The interview went on for about 20-25 minutes, I guess(since watches are not allowed). Q. Was your interview on the expected lines of what you had prepared or did they ask you totally unexpected questions? was it a stress interview? If yes, how did you handle it? It was not on prepared lines but it was general and hence manageable. The questions were not completely unexpected. The interview was very cordial. It was not a stress interview. Q. Any side details about technicalities like “make sure you bring xyz document, or you’ll face problem”? My OBC certificate was rejected, citing the reason that the office round seal was in regional language(Tamil). I was asked to submit a new one in 15 days. I was the president of the students union in my college. We organized a massive cultural festival called ‘TECHOFES’. Standing on the stage and inaugurating this fest in front of almost 10,000 students was the proudest moment in my life. Q:You have achieved so much in the academic sphere also(district topper, state topper, etc.). Were these not the proudest moments? Of course, these were proud moments, too. But, successfully organizing this festival was the proudest moment because it involved team work and the joy of collective success, while my academic achievements were individual feats. What is your take on Supreme Court recently striking down Sec.377 of IPC? I beg to differ with the Supreme Court. I feel that the rights of sexual minority, like the Right to privacy, must be protected. Sec. 377 is a colonial legislation, which is completely anachronistic in this liberal era. Sec.377 criminalises any “sexual act against the order of nature”. Who determines the order of nature? Just because a big majority exhibit a heterosexual behavior, it does not mean that homosexual behavior is unnatural. So, the rights of the gay community must be recognized and respected. Q:You have studied in one of the most prestigious technical institutions in the country(College of Engineering Guindy). But, despite such institutions, why is India still lagging in indigenous R&D? Lack of proper interaction between professors and students reduces the scope for the students to engage in good projects. There is lack of quality faculty in most colleges and even if there are any, they are reluctant to share their knowledge with students outside the classrooms. There is no university- industry collaboration, except in case of placements. This reduces the scope for demand-driven R&D. The member showed me his phone and asked: What are the various technologies in this phone? The member disagreed. Then I said, “Sorry Sir, I do not get what you mean to ask”. Q:How can you apply your ECE knowledge in forest services? RF tagging to monitor animals and to prevent poaching. GPs technology to monitor forest fires. GIS to classify forests based on density and to take conservation efforts accordingly. Q:How is it different from bar code reader? Q:How do you ‘derive inspiration from sports’(that’s my hobby)? Life is most often related with sports… bla.. bla.. won’t be required here, I suppose. What is the controversy about Sochi Olympics? Q. Is there any Indian sportsperson attending the Sochi winter Olympics? If so, name him/her and his/her sport? Q:What is the difference between GSM and CDMA? GSM: operates by time division multiplexing. CDMA: operates by code division multiplexing. Q:What are all the various forests you have visited? Q:Have you visited Guindy national park? Q:What are the endemic species there? Q:You are coming from Tamil Nadu, which is a very progressive and a developed state. But why is dowry still a problem in Tamil Nadu? Q:What is the difference between literacy and education? Literacy: Mere knowledge how to read, write and do basic arithemetic. Education: Makes a man truly civilized and mature. Makes him understand his own wishes and feelings as well as society’s aspirations. Suppose if they had asked you “Why do you want to join Indian Forest service?”, what would be your answer? I am a person who hail from a semi rural place. I loved my town, as it is located along the Western Ghats(Palani hills). So, nature was a part and parcel of my everyday life. Kodaikanal, the famous hill station, is located very near to my town. This created an inherent love for nature in me. Moreover, our family has deep roots in agriculture. Both my maternal grandparents and my paternal grandparents are still engaged in agriculture. So, I very well understand the need to conserve the environment and the forests, which provide basic ecosystem services especially to the rural people. Since this forest service allows me to live with the nature and love the nature, I liked it. Q. If you were not selected, what was your career backup plan? I did not have any backup in the mind, because I thought that it would distract me from my main goal. I believed in myself and so I backed myself to achieve what I set out to. Q. Many candidates prepare sincerely but constantly keep fearing about ‘profile insecurity’- I’m not from a big college, I’m not from english medium, I don’t have work-experience. what if they ask some stressful questions in the interview about this? Your message to these candidates? Many of my friends and seniors have got into services, even with a pretty ordinary profile or with education in Tamil medium. I do not think your profile speaks for you. It’s your personality that will speak, even during the interview. If you are confident about yourself and if you are able to convey what you think, then there is no problem at all. Q. Through this journey and success, what have your learned? What is the wisdom of life and competition? Never think of your friend or your co-aspirant as your competitor. Always be ready to lend a helping hand to your friends when they feel insecure. A few motivating words can do wonders. I have both been a giver and a receiver in this respect. So, I know the importance of the moral support of friends. The most difficult thing in preparing for civil services is to maintain your composure throughout the preparation period. It is quite natural if your motivation levels dip during this period, but it is important to stick to your goal and at least put in a few hours of study. Q. What is your message to the future aspirants? This preparation and the time and energy spent for it is always worth it, irrespective of the outcome in the exam. You’ll come out as a more mature citizen with a refined perspective. But, if you have this strong dream and if you put in your best, there is nothing that can stop you from succeeding. Q. Behind every topper. there are many people who stood by during those uncertain times when he/she was merely an ‘aspirant’. Would you like to tell the world, who were those people in your case? Any specific incidence that you would like to share with the readers? My friend Abinaya was one person who strongly believed in my ability to top these exams. She was one person who I could lean back for support, especially during troubled times. My friend Hariharan was a motivating presence in my life. My friend and roommate S.Gowtham was one awesome companion. He actually attended the IFoS interview with me but he could not make it. I am terribly sorry for him and hope he would get through into the civil services. My friend Vishnu Prashanth’s was a very calming presence. My senior Senthil Prabhu(IFos Rank:56) was a very good study companion and was a very good guide. Shankar IAS academy was one place which I just loved to be in. Shankar sir was my chief mentor. Whenever I was doubtful about my performances, I would just approach him. His very words gave me all the rejuvenating energy. He was the one who first advised us to prepare for IFoS. Only because of him, I and 15 of my friends have now got through IFoS. Chandru sir was always very approachable. Karthikeyan sir, who handled ‘FORESTRY’ optional, was instrumental in getting through my IFoS mains. I would like to thank all these people from the bottom of my heart. Q.final question- Did you use Mrunal.org for your preparation and if yes, how did it help you? And you can even reply “No”. I’ll publish your answer without tempering/editing it. Yes! I am a regular follower of Mrunal.org. This site was introduced to me by one of my seniors, when I had just started my preparations. Mrunal.org was especially useful in understanding complex economic concepts. For example, I still remember the beautiful examples given by Mrunal to explain the concept of VAT. It also helped me in science and tech and in personalities areas. congradulations Gautham. In Tamilnadu the OBC Certificate issued by the Tashilder is having the official round seal only in tamil.This seal issued by the Government of Tamil only in Tamil. How you settle the issue. Please clarify this which will be very useful for the new comers. Congratulations for this feat!…and wishes for many more in the LINE.. I was reading through your profile.last year you got through sbi po,also a hotly contested exam like the civils,yet you did not go in for it.just curious.did you feel a bank job would be too hectic leaving not time for preparation?gone are those days when people would take a bank job and do civils preparation alongside?is it advisable not to join sectors like banking,insurance if you are srious about civils? Actually my question is same as that of @kulanthaisamy… In Tamilnadu the OBC Certificate issued by the Tashilder is having the official round seal only in tamil.This seal issued by the Government of Tamil only in Tamil. How you settle the issue. 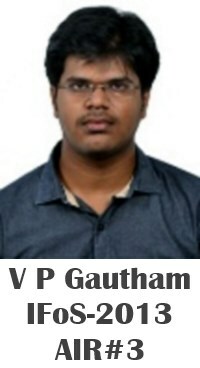 I HEARTILY CONGRATUALATE YOU GAUTHAM SIR! is it really mandatory that we shouldnt have flat foots and locked knees? is it really mandatory that we shouldnt have flat foots? Thank you so much Goutham for your infomation . But a small correction in your Information. The minimum height limit is 163 cm in case of Boys. It is Not 165 cm . please see the Indian Forest service website for further clarification. this guy has swindled a lot of money in Techofes the annual fest that he had headed .. he is no more than a mugger ..
please clarify what is exactly the height of OBC CANDIDATES 163 CM OR SOME RELAXATION? PLEZZ SOME BODY REPLY I AM 160 COM ,OBC WANT TO WRITE 2014 EXAM.. I HAVE SEEN THE IFOS MEDICAL INFO IT SAYS 163 CM (BUT FOR MEN OF ALL SC/ST /OBC OR GENERAL)OR ONLY (GEN). MRUNAL SIR PLEASE FILE AN RTI FOR FULL CLARIFICATION AND HELP THE ASPIRANTS. @MRUNAL SIR PLEASE TELL WHAT IS THE HEIGHT FOR IFOS EXAM SC—,ST–,OBC—AND GEN—AND RELAXATION IF ANY FOR MEN ?SOMEBODY HELP MEE…………………. @aravind i am 160 cm in height it means i will be disqualified in medical …so i may not compete this exam..please clear..
mrunal sir you reply please so i can swithc only to CSE EXAM NOW .. Exactly Mr. Mehta physical standards are also a qualification for this post…..
49 out of 200 for forestry II …..??? if we compare these marks with 2011or12 IFoS we can see how low the optional marks has come …. Definitely by introducing CSAT for IFoS UPSC has made a wrong move..i strongly feel that UPSC should conduct a seperate aptitude test for IFoS…. You cannot judge this by observing marks of one candidate in one paper. Overall cut off is higher this time (741 this year & 727 last year for Gen) and the marks of topper is also higher as compared to last yer’s topper. This year Sandeep Kumar Jha (898), last year-Vasavi Prakash(895). This year top 10 candidates have scored on an avg more marks than last year. Last year Rank 5 Shavata Jindal had 803 whereas this year Rank 08 has 850 marks. Rank 16 is around 800 this year. So don’t make sweeping conclusions from one observation. How do you know the marks of the other candidates? Are the marks of all the recommended candidates publicly available? Congrats to you sir…why dont you take geology as an optionals in CSE mains..Both the geology syllabus are similar.. Cannot thank Mrunal enough for toppers’ interviews, the motivation they provide is immense. Thanks a lot for helping me with this exam. Sir I am BSc in Biochemistry. and have Chemistry as a subject for one year only am i eligible for IFoS?? 1.) Is Indian forest service a complex career for women ? as many challenges would come up front to deal through-out the service. Only guys are fit for this service? 2.) I am IT professional ( 8 yrs experience till date) having minimum time to allocate for studies, as I would need to deliver many work related roles and responsibilities every day. Can I crack IFOS without coaching and with studying individually? 3.) If yes, Could you kindly suggest me best preparation plan, study materials, books to read and notes making, mock test series preferred to enroll, current affairs, education forums who clarify subjects issues, provide mentors guidance and support. I would be very grateful to you, if you can clarify my ambiguities.